Halloween 2012 is almost here, and over the next few days we will see how many hours Wii owners in the US have reported playing different zombie related games. Do zombies drink coffee? It probably depends on your definition of zombie, but apparently they do like shopping malls. Dead Rising: Chop Till You Drop was released for the Wii on February 24, 2009 with a MSRP of $39.99. The game received an ESRB rating of "MATURE" with "Blood and Gore, Intense Violence, Language" listed as content for gamers and parents to be aware of. 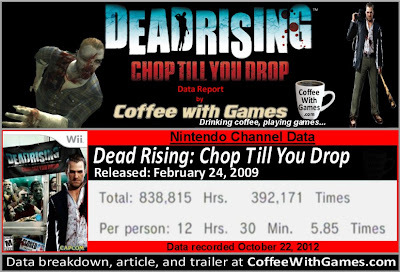 How many hours of gameplay can you expect from Dead Rising: Chop Till You Drop, and how many more US Wii owners and hours have been reported battling zombies in Colorado with Frank West since the last report? Brew yourself some coffee, and let's take a look! 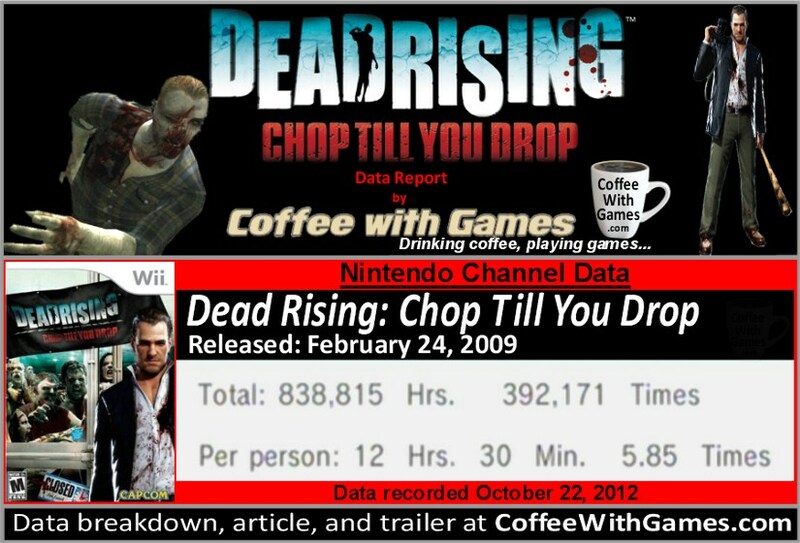 Dead Rising: Chop Till You Drop now has approximately 67,037 Wii owners in the US that have reported hours of gameplay, with 1,336 days possibly reported. This is an increase of just over 27,000 more Wii owners that have reported gameplay data, in the last 2 years, since the first report on the game. The game has also seen an increase of about 370,955 more Total Hours reported, than was first shown reported. The reported average play-time is now 12 Hours 30 Minutes "Per person" as the image shows, which is 45 minutes higher than the average just over 2 years ago. which now averages out to about 2 Hours 8 Minutes per day/session played. What about reviews? Well, the "professional" review score average for the game is 61.23%, based on 26 reviews on GameRankings.com. The customer review score average is 71.87%, now based on 32 reviews from Amazon.com. I have never played Dead Rising, any version of it, though after getting in a zombie kick here lately with "The Walking Dead" series, I'm almost tempted to pick this up and see how it plays. If you have seen anything from "The Walking Dead" series, I think the term "mall walkers" is not only very appropriate to describe the zombies in Dead Rising on the Wii, but very ironic since that is a term for people that participate in mall walking. I think it's good seeing the average hours reported "Per person" continue to increase on this game, even if slowly, over the last 2 years. While I'm not in a rush to grab the game, if I'm ever looking for an extra used game in a "Buy 2, Get 1 Free" GameStop or even BestBuy used sale, I can remember this one should give me a solid 10 hours of gameplay, at the minimum. Did any of you enjoy Dead Rising Chop Till You Drop for the Wii, and would you recommend it now as a cheap buy? Here's a game I've never played and never really had any interest in, lol. But the data is interesting - it seems to suggest this is a game that a fair few people come back to - thus increasing their playtime with it. It also seems to be a game that a lot of people buy second hand/ on discount - that's a big percentage increase in people who have bought the game well after its initial release. "It also seems to be a game that a lot of people buy second hand/ on discount..."
Yeah, it can be found "used" pretty easily, at least from my searches. Apparently, they were expecting it to sell about 500K units from what I read while doing this post, which is more than I would have though initially...but I'm not sure how many it ended up selling for sure, or if they ever clarified it. In all honesty, I quite enjoyed this version of the game. The shooting was just like playing Resident Evil 4: Wii Edition. Some didn't like the change to the formula (no time limit), but I loved it. Great game and one that just missed my list of the top 50 WIi games. I remember the original (this one) being really well received by critics when it released on the Xbox 360 in 2006, but then it was like 4 years before Capcom continued the series, and there was Left 4 Dead, Call of Duty, and other zombie games out then, and I'm not sure how the gameplay stacks up to those being third-person versus first-person. "The shooting was just like playing Resident Evil 4: Wii Edition." I kept wondering the meaning when I read "Utilizes the same engine as Resident Evile 4 Wii edition." while putting this together. I played RE4 on the Wii, and thought the graphics were good in the game...Dead Rising just didn't seem to be the same level of detail/quality, from the images/trailer, but now that you mention the controls that would make sense. It was a good budget game. Ugly as home made soup, but fun to play. I've beaten it over 10 times. "I've beaten it over 10 times." Is the average reported in the data, 12 hours, about how long it should take for a first time play-through; and once you know how to do things, can it be beaten a lot faster? Thanks for the comment/feedback! I want me some home made soup now!